What is a Praying Mantis? The praying mantids, or praying mantises, are carnivorous insects that belong to the family. There are about 2,000 species of mantids. The biggest praying mantises are the Tenodera and the Archimantis, which are six inches long! The smallest praying mantis is the Bolbe pygmaea, which is only 2/5 of an inch, or one-centimeter. Unbelievably, some scientists agree the mantis is closely related to the cockroach. The name "mantis" comes from the Greek word for 'prophet' or 'soothsayer.' The Carolina mantid is a common insect of Eastern United States. The European and Chinese species were introduced to the Northeastern United States about 75 years ago as garden predators in hopes of overtaking the native pest population. Praying mantises are about 2/5-12 inches according to species. Their colors vary, ranging from light greens to pinks. 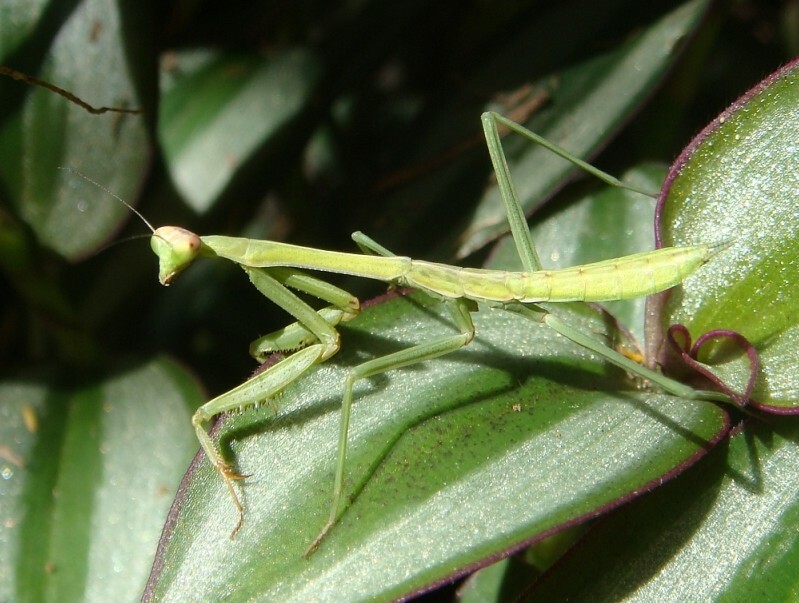 Most mantids are pea green or brown. The tropical flower mantises, which resemble flowers, are usually light colors such as pink. Flower mantises, from Africa or the Far East, so closely resemble flowers that insects will often land on them to get nectar. Camouflage is very important for the praying mantis' survival. Because they have so many enemies such as birds, they must blend in with their habitat to avoid being eaten. They have a triangular-shaped head with a large compound eye on each side. Praying mantids are the only insect that turn from side to side in a full 180-degree angle. Their eyes are sensitive to the slightest movement up to 60 feet away. They have straight, leathery forewings and very powerful jaws used for devouring its prey. They have ultrasound ears on their Metathoraxes. The Metathorax is located on the thorax. Also, the males' genitalia are asymmetrical. They have a long prothorax and strong, spiny front legs held together in a praying manner. In the bodies of some species of mantis, there is a hollow chamber. Recently it has been discovered that these hollow chambers provide the mantis with a means of detecting bats, one of their most feared predators. Apparently, the mantis in flight will drastically change its flight pattern (often hurling to the ground in a spiral) when the mantis hears certain frequencies of sound. Nearly 2,000 species of mantids are widely distributed throughout tropical, subtropical, and warm temperate areas of the world. Different species live in many parts of countries such as North and South America, South Africa, Europe, the Southern parts of Asia and some parts of Australia. Praying mantids in North America are usually green or brown. There are three main types of mantids in Eastern United States: the European mantid (Mantis religiosa), Carolina mantid (Stagmomantis carolina) and Chinese mantid (Tenodera aridifolia sinensis). The praying mantis is a carnivorous insect that takes up a deceptively humble posture when it is searching for food. When at rest, the mantis' front forelegs are held up together in a posture that looks like its praying. These front legs are equipped with rows of sharp spines used to grasp its prey. They wait unmoving and are almost invisible on a leaf or a stem, ready to catch any insect that passes. When potential prey comes close enough, the mantis thrusts its pincher-like forelegs forward to catch it. The prey probably won't escape because the forelegs are so strong and armed with overlapping spines. The mantid bites the neck of its prey to paralyze it and begins to devour it. The mantis almost always starts eating the insect while it's still alive, and almost always starts eating from the insect's neck. This way, the mantis makes sure that the insect's struggle stops quickly. Praying mantises eat insects and other invertebrates such as other mantises, beetles, butterflies, spiders, crickets, grasshoppers, and even spiders. The praying mantises also eat vertebrates such as small tree frogs, lizards, mice and hummingbirds. Praying mantids can resemble flowers and can catch small, unknowing hummingbirds. Praying mantids also eat other nesting birds. Breeding season is in the summer in temperate areas. After mating, the female will lay groups of 12-400 eggs in the autumn, in a "frothy" liquid called an "ootheca", that turns into a hard protective shell. This is how these insects survive during the wintertime. Small mantids emerge in the spring. Often, their first meal is a sibling. Young mantids or nymphs, also eat leafhoppers, aphids and small flies. Young mantids will shed many times before it is full grown. It takes an entire summer or growing season for mantids to mature to adulthood. One generation develops each season. Many species of mantids resemble ants when they are small, but as they go through a series of molts, they begin to look more like adult mantids. Most often people think mantises are pests. That is only partly true. They can be beneficial, too. Praying mantises are terrific pest exterminators. They keep down the population of bugs that are a threat to farming. A master of disguise, the praying mantis can be an able assistant to farmer and gardener. Look carefully in your backyard. Perhaps that deceptive shape is a praying mantis poised for his next meal.